The top 3 teams right now are Aaron Burmeister, Jeff King and Aliy Zirkle; however Aaron and Aliy have not taken their mandatory 8-hour rest yet. The race has been traveling through inland Alaska so far but it’s said that the real competition starts when teams hit the coast at Unalakleet, which is two more checkpoints away. The seventh day of the Iditarod found the leaders at Unalakleet, on the coast 718 miles from the Start. Aaron came in about 2 hours ahead of Aliy and they were resting there when last year’s winner, Dallas Seavey, pulled through Unalakleet into the lead, planning to rest his team further along the trail. He’s happy with his dogs, who are eating well and running fast. Historically, it’s been proven that anything can happen on the run along the coast due to weather and winds. 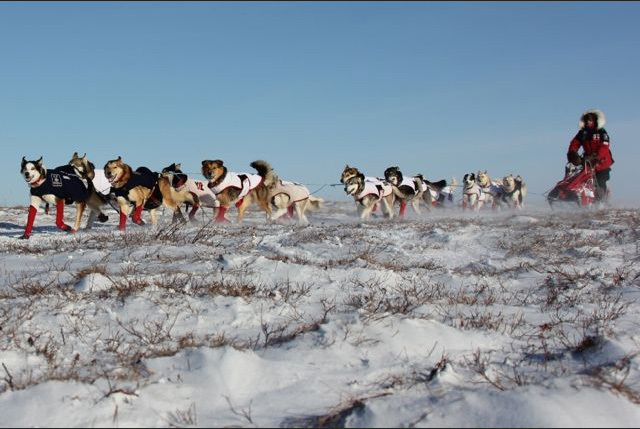 Teams that have been in the lead were overtaken and teams have come from behind to be first into Nome. All teams but one have completed their mandatory 8 and 24 hour layovers and the race is now down to 71 teams. Four teams still have 16 dogs, but most have streamlined down to 12 or 13 dogs. It has been bitterly cold which is hard on the mushers, who must take their gloves off to feed, water, put booties on and care for their dogs. Aaron was the first to arrive at the last checkpoint of Kaltaq and was presented the Bristol Bay Native Corporation First Fish Award of $2,000 and 25 pounds of filets delivered to his home. He also won the First to the Coast Award of $3,500 in gold nuggets from Wells Fargo when he got to Unalakleet after 11 hours on the trail. Many people from his hometown Nome, 261 miles away, were there to cheer him on. The eighth day of the Last Great Race is run along the coast, over sea ice, on its way to Nome. The race has a new front runner, last year’s winner Dallas Seavey, who passed Aaron and is now 9 miles ahead of him. Four miles behind Aaron a ‘race within a race’ is happening between Aliy and Jessie to determine which woman will be first to Nome. The last 3 years Aliy has been the top finishing woman, but the 4 years before that it was Jessie. One mile behind them are Dallas’ dad, Mitch, and one of the Norwegian racers, Joar Ulsom, who are virtually tied. The top 6 teams are not separated by very much, so anything can happen! Snow conditions are difficult, recent light, dry powdery snow with temperatures warming to 18 keeps it from packing and makes running slow and difficult. It’s being compared to running in sand dunes. Teams rest and travel various lengths and it’s still 170 miles from Koyuk to Nome. 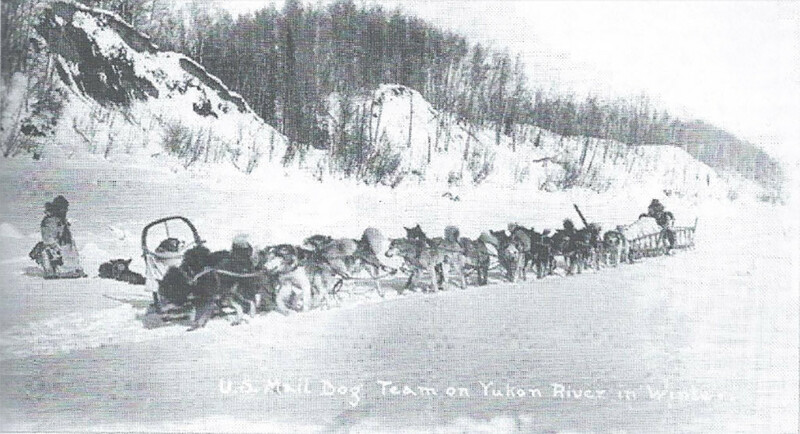 The Iditarod Trail was originally a mail trail and modern mushers honor that history by carrying mail cachets (packets of letters) down the trail to Nome every year. They’re used today as part of a fund-raising project and postmarked in Anchorage and Nome with each racer in the Iditarod carrying a cachet. The US Postal Service kept expanding with the country’s growth and in Alaska the gold rush era mandated that mail be delivered to places with no roads or railroads. The native-bred huskies were perfectly adapted to travel over snow and ice to bring mail to those outlying communities. By 1901 a network of mail trails had been developed including a system that follows most of the Yukon River in winter. 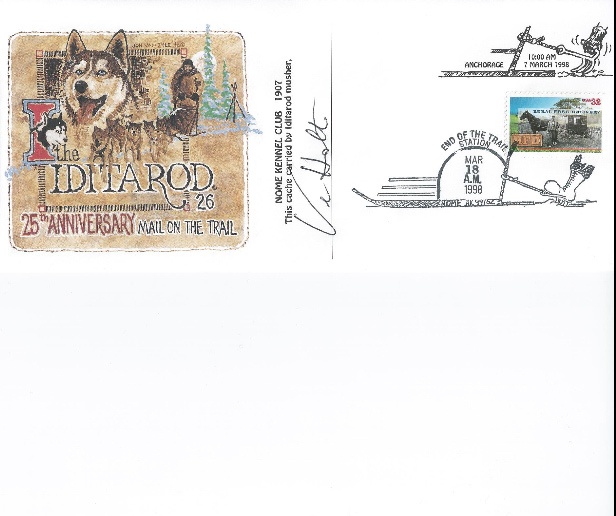 The historic Iditarod trail was the primary dog trail that carried mail from ships arriving in Seward all the way to Nome using overnight roadhouses along the trail. 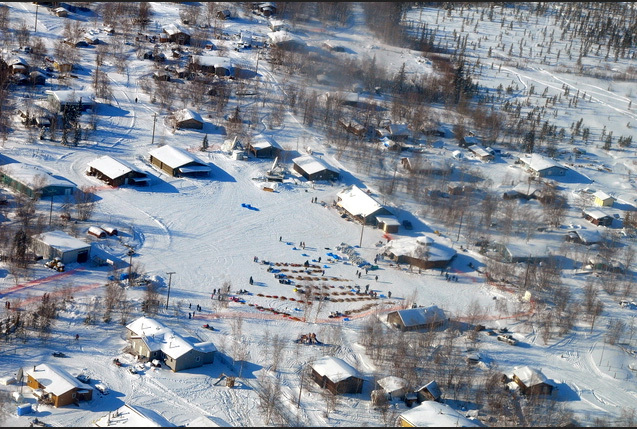 Aerial view of 11 teams resting in the village of Huslia. No storms are predicted so weather conditions should not play as big a part in affecting the outcome of the race as it has in other years. All teams are required to take a mandatory 8-hour rest at White Mountain before heading out for the final 77 miles, with one more checkpoint of Safety between them and the finish line! Dallas Seavey’s team pulled into White Mountain first with his dad Mitch following him in second place. We will know the winner of this long and challenging race tomorrow! Dallas Seavey — the first to pull into Nome at 4:13 a.m. after many hours on this challenging trail! He and all the teams faced multiple 40 degrees below temperatures, sleep deprivation, wind and deep drifts of freshly blown powder (or “soft snow”) that he was breaking trail through because he was in the lead all the way up the coast. He was followed 4 hours later by his dad Mitch and then Aaron Burmeister. In the ‘race within the race’ involving the top two women, Jessie Royer was first into Nome followed by Aliy Zirkle, who came in second last year by mere minutes. As the winner of the 43rd Iditarod of 2015 Dallas received $70,000 from the 4 major sponsors and a ’15 Ram Quad Cab 4×4 truck from the Anchorage Chrysler Dodge dealership in any color he chooses. Reef and Hero, his two lead dogs, were given wreaths of yellow roses and lots of love from Dallas. They led this fast team and because they’re only 3 years old we can expect to see more of them in the future. Nome is the final checkpoint and every racer’s sled is checked for the last time to ensure that it has the required items: vet book, sleeping bag, hand ax, snowshoes, mail packet, cooker and booties. The native villages along the trail have been thrilled to be part of the excitement of the Iditarod. The town of Nome’s population swells with all the fans and media that are there to see the racers complete their runs as they go under the arch erected at the finish line. 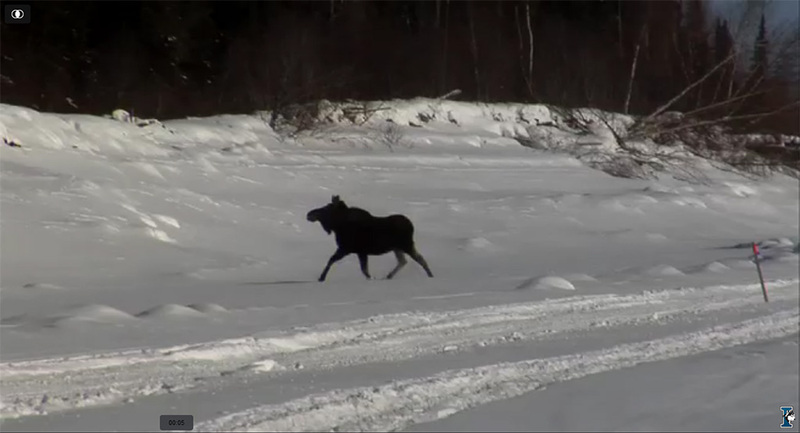 Check the Iditarod.com site to see how the other competitors did… Happy Trails! *Special thanks to correspondent Susie Stevens-Briody for a great roundup of this year’s Iditarod Race!